My problem arises from originally having MB set up wrong, and now that it's configured the right way, I'm still left with some oddly incorrect metadata and am trying to find a way to simply refresh (rewrite) it all. I save it and all is good. Except, I really don't want to do this for EVERY SINGLE EPISODE, because that would be mad. Any help would be beyond awesome. I have the same request / comment. I am trying to get my library refreshed. I did not have artwork embedded in my mp3 tags for my music library so i have used a tag editor to get them all included, however Media Browser doesn't seem to recognize. I have deleted all folder.jpg files and also any album.xml files and used the scheduled task to read the library all to no avail. I guess my plan is to force a re-build. Is this the correct file to delete? The best way to get support is to not do that. It's not a documented process and we don't have the manpower to debug if that type of action causes a problem. Just do refreshes from the editing area that's all you need to do. Okay, Luke I have a similar problem and I've tried several refreshes and it doesn't work. I'm using MBClassic in conjunction with server. I have my Movies, Videos, Music and Photos setup in server to share out to Classic clients. All works well except for Photos. I had some original photos that had bogus "Date Taken" information that was set well out into the future (like year 2022). When I go to the Photos folder in Classic it always shows these photos as the latest. No matter how many recent photos I've added these old photos (actually taken in 2003 but dated 2022) always show up as the "Latest" in the folder. 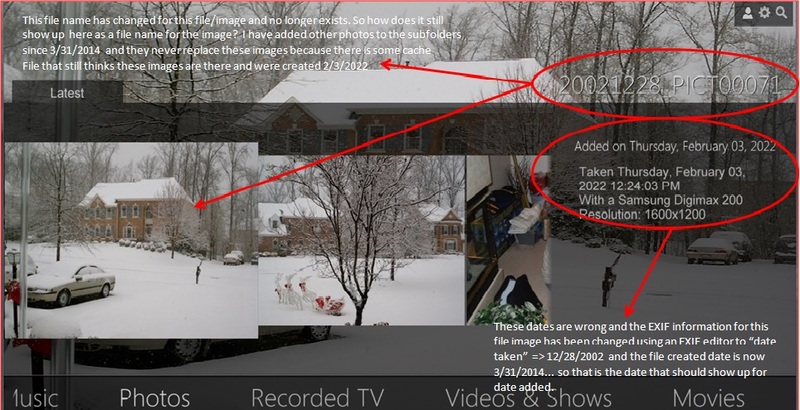 I have since changed the metadata to the correct "date taken" but these photos still report 2022 as the date taken and will not allow for any recently added photos to show on the Photos intro screen. I have tried removing the photos from the actual folder but the images remain. I have tried renaming the photos...no change. I have tried removing photos completely but each time I reapply it always comes back with these same future dated images as the latest. I can change the folder to a sub-folder under my top level pictures folder and the images will change but as soon as I go back to the top level it reverts back to these no longer existent photo images. How do I clear the library cache so that I can re-build this portion so that MBServer can correct the metadata and choose the actual "most recently" added files instead of the ones that it has mistakenly fixated on as the most recent based on incorrect metadata? Where does Server store this metadata to make the decision about "what is the most recent files" or the most recently watched or unwatched? Photo metadata is pulled out of the photo exif data so you will have to correct that inside the jpg itself. Our metadata editor does not currently write this information back into the photo. That has already been done. Cleaned EXIF data with a file cleaner and changed the file name so that date created is a more recent date but the date I inserted after the EXIF clean does not match the one showing in MBServer/Classic. MB still shows a date of Feb 2022. The metadata of the files show March 2014 for created and Dec 2002 for date taken as that is when I renamed the files, cleaned the EXIF and reapplied the correct date taken through a metadata manager. MBServer/Classic is ignoring that and still using old data or maybe an old image cache somewhere that has been superseded. How do I clear the cache or library so that it will repopulate with the new/changed data and show the correct image previews? Edited by EZEd, 04 April 2014 - 07:31 PM. You changed the actual file name of the jpg? If that's so then there is no way we can be pulling any old information as it wouldn't be anywhere since the name has changed. Are you absolutely sure the date isn't hidden in a tag in the file somewhere? Can you post a screenshot of one of these images in either MBC detail page or the web client detail page - where the overview would show? i see we're pulling it from the ExifTags.DateTimeOriginal field, so first it comes from the file date stamp, then if the photo has metadata it gets replaced using that. The attached image explains it all...just need to know how to clear the cache that is making this happen. Choosing any other subfolder makes it behave correctly. But I have all photos in sub-folders ID'd by year and all photos in that folder are file named with the date taken in the file name. So 2014 is the latest folder and should have the latest photos. These particular images were originally imported with incorrect EXIF information. That EXIF information has since been changed but MBServer does not recognize that it has been changed. The file names have also been changed for these images but yet, MBServer still thinks these images with the indicated file names exist. Which is no longer true. I have done multiple refreshes and have removed and added the photos category several times but this screen always reverts back to this if I choose the entire Photos folder. I have even changed the name of the folder to Pictures and MBServer still will not change this info or these images. The fact that overview says what it does tells me that the Exif data in that file still has that value. If you take that jpg and put it in a whole new folder that MB sees, do you get the exact same information in it? If so, then the Exif data is still there with that information. As I originally said...I have even gone so far as to have completely deleted these files from the folder and refreshed MBServer yet this same screen shows up with the same information. If I highlight the image from here and hit play...it takes a while but it will show the image. That is how I know it is being cached somewhere other than the folder where the actual file is located. If I then go to the physical folder where the jpg files are located it is confirmed that these images are NOT in the folder. So what is MBS reverting to to read images that aren't physically there? It has to be an image cache somewhere other than the location I am pointing to in my media library set up. Deleting them isn't the same as taking the same physical file and giving it an entirely new path by putting it in a different folder. If you would please try that, and report back on the information that is gathered from it, then we will be certain whether or not any of the bad information still remains in that file. Since all our caching is based on paths, if you create an entirely new path there is no way anything could be coming out of a cache in that instance. Or, as Luke suggested, just attach the image and then we can try it ourselves. Thanks. Attached is the newly modified file of that image that is highlighted. Both the file name and EXIF information has been changed. There are roughly 50 or so of these images that have had EXIF info cleaned/reapplied and jpg file names changed yet MBServer still reports them as being as listed in the image attached in previous post. Again this is how I know these images are being cached in some other location. Actually can you zip it up. i think the forum scales it and that affects the contents of the image. thanks.